Dhaka, June 16, 2015 – The government of Bangladesh signed an agreement today with the Netherlands and the World Bank Group including its private sector arm, the International Finance Corporation (IFC) with the 2030 Water Resources Group to strengthen management of the Bangladesh Delta, Asia’s largest and the world’s most populated delta. 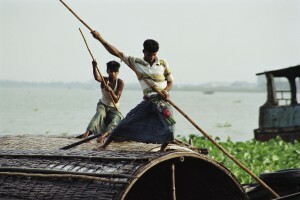 The partnership will help to develop and implement the Bangladesh Delta Plan 2100, a long term and holistic vision for the Bangladesh Delta, and help to realize Bangladesh’s goal of becoming a middle-income country by 2021 while maintaining the unique biodiversity and physical characteristics of the delta. The Bangladesh Delta planning exercise is to a great extent concerned with water and land resources management but it takes a holistic approach by encompassing other relevant sectors (such as agriculture, industry, transport, energy, etc. ), which are critical for economic growth and relevant for environmental management. The Bangladesh Delta Plan (BDP) 2100 will also include the forming of appropriate governance apparatus to facilitate inter-ministerial coordination and a Delta Fund to make investments into delta infrastructure possible. The Delta Fund, once established, will be a block allocation of 2% of the GDP (total GDP estimate by World Bank for 2013 was $150 billion) contributed by not only the government but also the private sector. The 2030 WRG and IFC will work to facilitate and mobilize private capital in the various infrastructure projects related to water resources management under the BDP 2100 partnership. The 2030 WRG will also facilitate inputs from the private sector and civil society to improve the enabling environment for more private sector investments in water infrastructure. Two-thirds of Bangladesh lies in the Ganges-Brahmaputra-Meghna Delta and calls for special focus to sustainable delta management. Beset by an already high and growing population density along with growing urbanization, proper planning and management of the delta will secure Bangladesh’s future development over the next decades through improving water safety, food security, and disaster resilience. The Delta Plan aims to create a long-term vision for delta management, prepare for different scenarios and responses, identify and organize government institutions to address challenges and create and facilitate a long-term investment program bolstered by private sector participation and development partners. “Greater delta resilience and sustainability will build a stronger foundation for poverty reduction and development,” said Lia Carol Sieghart, Program Leader, World Bank. 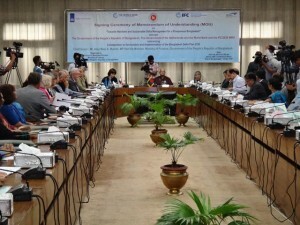 The partnership among the Government of Bangladesh, the Netherlands and the World Bank Group will facilitate the sharing of knowledge and information among the participating governments and the World Bank Group; identifying and implementing joint activities; and, building on respective expertise and capacity. The agreement builds upon another agreement signed between Bangladesh and the Netherlands in 2012. “Like all delta countries, Bangladesh and the Netherlands share a common cause to manage these complex environments. They are, therefore, natural partners in the exchange of knowledge and know-how,” said Melanie Schultz van Haegen, Minister of Infrastructure and the Environment of the Netherlands while also stressing the importance of a preventive approach to reduce the risk of disasters. Lilianne Ploumen, Minister for Foreign Trade and Development Cooperation of the Netherlands, added “the Bangladesh Delta Plan can only be a success if it benefits all people in Bangladeshi society”. She urged in that connection “to give proper attention also to the interests, views and roles of the poor, the landless people and within those groups particularly to women”. Over the last decades, the Bangladesh government has invested more than $10 billion to make the country less vulnerable to natural disasters. Measures as strengthening river embankments, building emergency cyclone shelters, and developing world class community-based early warning systems have significantly reduced the loss of life and livelihoods and property damages caused by extreme weather events. “The partnership and the plan are so vital because meeting the immense water challenges requires resources and commitment from many actors. This plan will unite government, international financial institutions, non-governmental organizations and the private sector in Bangladesh for the benefit of the inhabitants of the delta,” said Anders Berntell, 2030 Water Resources Group Executive Director who signed the MoU on behalf of IFC / 2030 WRG. The Memorandum of Understanding was signed by Abul Maal Abdul Muhith, Lilianne Ploumen, Lia Carol Sieghart, and Anders Berntell, on behalf of the Government of Bangladesh, the Government of the Netherlands, the World Bank and IFC/ 2030 WRG respectively at the Economic Relations Division. If you know any initiatives that focus on reducing water use or managing water risk globally, help us share your best practices with the larger water community. How to submit your case study? Where was your initiative located? What were the objectives and outcomes of the intervention? When was the intervention undertaken? Water scarcity is also viewed as a top threat to society by heads of states, business and non-profits, as reported in the 10th Global Risk Report by the World Economic Forum (WEF), and there is predicted to be a 40% gap by 2030 in demand and availability of freshwater according to 2030 WRG. Recent droughts in California and Sao Paolo highlight some of the increasing challenges faced by decision makers around the world from both the (developed and developing) in balancing the need for municipal water supply for citizens, the needs of agriculture and industry, and the maintenance of environmental flows to protect the river basin ecosystems. The 2030 Water Resources Group is taking a leading role in identifying and publishing examples of initiatives that have been implemented to manage water scarcity. 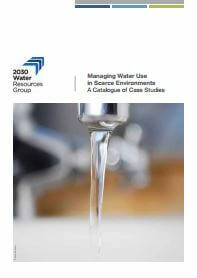 In 2013, on behalf of the 2030 Water Resources Group, Arup identified 40 case studies from around the world that showcased such innovative solutions in ‘Managing Water Use in Scarce Environments: A Catalogue of Case Studies’. 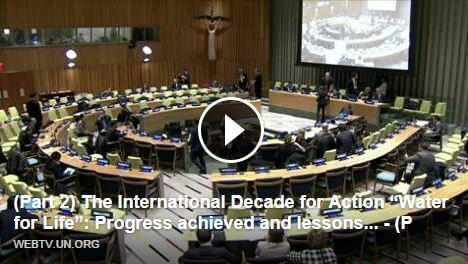 The publication inspires action and is utilized throughout the world by leading industry, policy makers and the 2030 WRG country programs. Based on the positive feedback WRG received from various stakeholders on the first edition of the Catalogue of Case Studies, 2030 WRG initiated a second phase of the project which will identify a further 40 case studies. The online catalogue with a number of new case studies has recently been launched at the 25th Stockholm World Water Week in Sweden. The revised publication ‘Managing Water Use in Scarce Environments: A Catalogue of Case Studies’, will analyze projects where actions were taken to address the water scarcity. These new case studies will utilize the simple but robust framework and assessment methodology used to evaluate projects presented in the pilot catalogue published in 2013. A tool to test the current framework for the evaluation of case studies, both with respect to cost per cubic meter of freshwater saved/made available and the benefit of contributing to close the water gap. The latest catalogue contains a wider array of case studies. 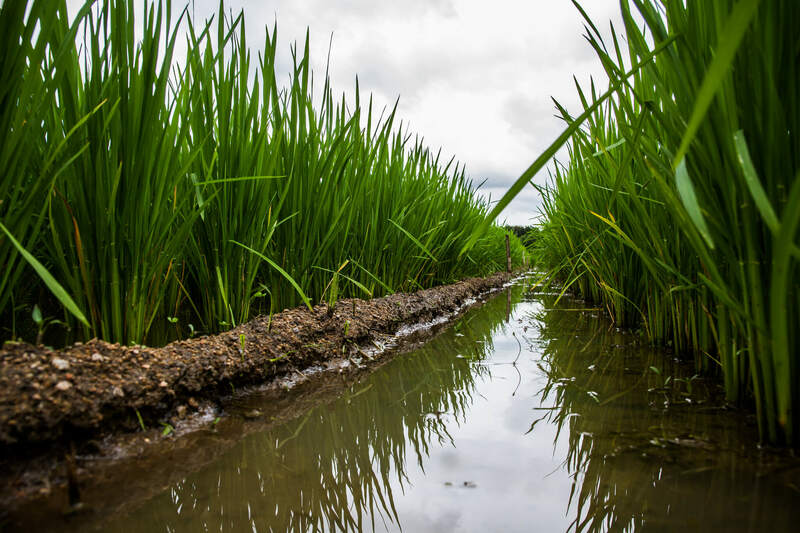 These include small-scale agricultural interventions and micro-irrigation technologies in Peru, a wastewater reuse project at an industrial complex in India, and a global corporate water efficiency program by Anglo American mining group. It also showcases innovative ideas such as the use of remote sensing and satellite imagery to optimize water use in farming and the utilization of new online platforms to influence behavior change in consumers. The range of projects highlight that improved management of water can be achieved in a wide range of circumstances provided the right combination of drivers are present. The case studies also highlight the need for improved collaboration between the public and private sectors; standardized data collection, monitoring and reporting; and a means of ensuring action is relevant at river basin scale. Arusha, 4 June, 2015 — The Tanzania Horticultural association (TAHA), the Pangani Basin Water Board (PBWB) and 2030 WRG are collaborating to catalyze collective action in the Pangani basin. To this end, the Arusha Kilimanjaro-Meru Water Stewardship Workshop was organized where leading horticulture companies identified specific challenges and prioritized areas of critical interest. Recognizing that water is becoming a pressing concern and certainly a longer-term risk faced by the horticulture industry in Tanzania, and the fact that water use pattern in the sub sector contributes to the pressure on allocation of the resource, TAHA, PBWB and 2030 WRG are collaborating to explore opportunities to address water-related concerns in horticulture areas of the Pangani basin – upstream Nyumba ya Mungu Dam. Within this context, the Kilimanjaro-Meru Water Stewardship Workshop was a first opportunity to engage leading horticulture companies in identifying specific challenges and prioritizing areas of critical interest and momentum. The meeting aimed to extend the partnership to horticultural actors in Moshi and Arusha, to share and discuss Water Resources Management Challenges in the Sub Basin, and to strategize a way forward to collectively address the challenges. In their opening remarks, TAHA and PBWB highlighted the urgency of bringing public and private players together around a common agenda to improve water stewardship in the basin in an effort to address the growing water scarcity challenges faced by businesses and the population. Horticulture in the Kilimanjaro and Meru catchment areas can serve as a good place to initiate a joint water stewardship initiative but with a view to expand to other sectors and in time, to other geographical locations. Several horticulture companies are already implementing relevant activities with their surrounding communities, often in partnership with other private sector solution providers and with development partners. While several private sector initiatives are already underway to serve smallholder farmers (SHs), the challenge is in identifying and packaging the opportunities at an attractive scale (e.g. pools of smallholder farmers, adequate technologies and a clear business case). The Government of Tanzania also has significant initiatives, such as the newly created National Irrigation Commission, investments made in SH irrigation infrastructure by the PBWB, the emerging Agriculture Development Bank and the Catalytic Fund (to be implemented in the SAGCOT area). The Government is also working to develop the institutional governance structure provided for in the Water Act, and has recently approved the creation of additional catchment committees in the Pangani basin (including Kikuletwa Catchment). The government can also play a key part through improvements of the investment climate. The main challenges highlighted in the workshop include (i) difficulty to negotiate water-sharing agreements with upstream water users and challenge to introduce water pricing; (ii) inefficient SH water use and insufficient infrastructures; and (iii) need to review a broader range of water use efficiency measures and explore crop-specific agricultural practices. Emerging priority action areas include raising awareness to more catchment actors regarding the importance and urgency, on the one hand, of joint catchment management, equitable allocation of shared water resources, water use efficiency and water rights; and, on the other hand, of water efficiency solutions, business case for various improved agricultural techniques, and innovative SH-inclusive business strategies involving multiple risk-sharing partners. Another priority calls for efforts to systematically identify and prioritize a pipeline of SH farmer water productivity opportunities, while also including private sector, government and development partners around each opportunity. Working with the PBWB and its branches is a necessary step to prioritize strategic public sector investments where strong opportunities exist to leverage private sector action. At the same time, policy advocacy concerns include the need for identifying, documenting, justifying, and feeding into urgent reforms linked to water resources, particularly linked to incentivizing water use efficiency. Finally, it is important to ensure proper results measurement, monitoring and evaluation of activities under the joint action plan so that all contributing partners can use the outputs in their own reporting. In their closing remarks, TAHA and the PBWB indicated that this was only the beginning of a process of collective planning and action to address the urgent water challenge in the catchment (Kilimanjaro and Meru catchments). The main next step is to generate a joint business plan for what will be branded as a new initiative though building on already ongoing partner activities. This will serve as a unifying action plan for water stewardship, with key activities, objectives and indicators (logframe) alongside budgets, incorporating ongoing and future activities relevant to these objectives. The 2030 WRG Tanzania partnership was launched in 2013, following a high-level invitation from the Government of Tanzania to the 2030 Water Resources Group, and became operational in late 2014 with a public-private management board and a series of working groups. The 2030 Water Resources Group (2030 WRG) and Hindustan Unilever Foundation (HUF) are partnering to develop innovative, large-scale solutions for India’s water challenges. The solutions will focus on technology, finance, knowledge, and results-based implementation and will target the agriculture sector, which uses around 80 percent of the country’s water resources. It will impact one million farmers and save up to 4 trillion liters of water. According to 2030 WRG estimates, India will have a 50 percent water deficit by the year 2030. This partnership will adopt a multi-stakeholder approach to promote efficient water-use practices and technologies among farmers, incubate new models, knowledge, and tools to drive behavior change, and catalyze replication of best practices. This, in turn, will contribute to water and food security through reduced agri-water use and enhanced agricultural productivity. The success of this model of implementation will provide inputs for making necessary policy recommendations. The program will leverage thought leaders, enablers, decision-makers, and implementation organizations across public and private sectors, civil society, and academia. It will establish state-level networks to facilitate agri-water efficiency and pollution reduction. Its Practice-Based National Agri-Water Policy Leadership Forum will provide strategic thought leadership for agri-water policy development. 2030 WRG and its partners design and implement water source security solutions for long-term economic growth, environmental protection, and social impact in select countries. In India, 2030 WRG has partnered with the central government and the governments of Karnataka and Maharashtra for demand-side water management at scale across agricultural, urban, and industrial sectors. The 2030 Water Resources Group is an innovative public-private-civil society platform for collaboration at the global as well as national levels. 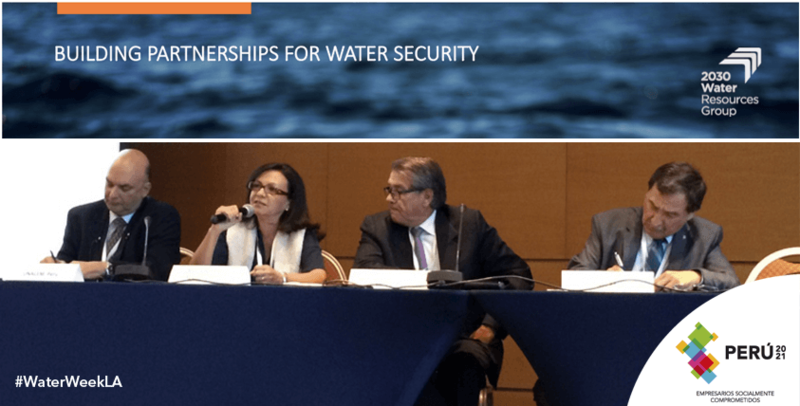 It mobilizes stakeholders from public and private sector, civil society, centers of academic expertise and financing institutions to engage in fact-based, analytical water security approaches and coalition building. The 2030 WRG was initiated in 2008 by a few multinational companies, donors and development banks. After an incubation phase within the World Economic Forum, it has been hosted by the International Finance Corporation, a member of the World Bank Group, since March 2012. Hindustan Unilever Foundation (HUF) is a wholly-owned subsidiary of Hindustan Unilever Limited (HUL) and was established in 2010. HUF has initiated 18 projects in more than 4000 villages across 13 river basins in 13 states in India and created a collective and cumulative water-harvesting potential of nearly 100 billion liters across India and aims to generate, along with its partners and communities, a collective water potential of 500 billion liters across India by 2020. The 2030 Water Resources Group congratulates Nestlé for winning the first Corporate Water Stewardship Award for technology that allows a Mexican dairy factory to operate without using any local groundwater. Each year, the coveted Global Water Awards are presented at the Global Water Summit (27 & 28 APril), the major business conference for the water industry worldwide. The Awards acknowledge the most important achievements in the international water industry within several categories. The Corporate Water Stewardship Award will be awarded this year for the first time. The prize honors the company which best reflects the objectives of the 2030 Water Resources Group in achieving creative solutions for improving water security. This year’s Summit focused on the theme of the Water Value Revolution, bringing together government & utility leaders, senior executives, investors & best practitioners from across the global water industry. The ambition is to determine water’s key role in the future of sustainable economic growth & to revolutionize the role of water in the global economy. The CWS Award is very important for the work that the 2030 Water Resources Group is doing around the globe. Efforts to catalyze collective action on the ground can not be sustained without a shared commitment to increasing access to safe water. 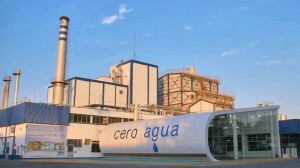 Nestlé Cero Agua factory Mexico. 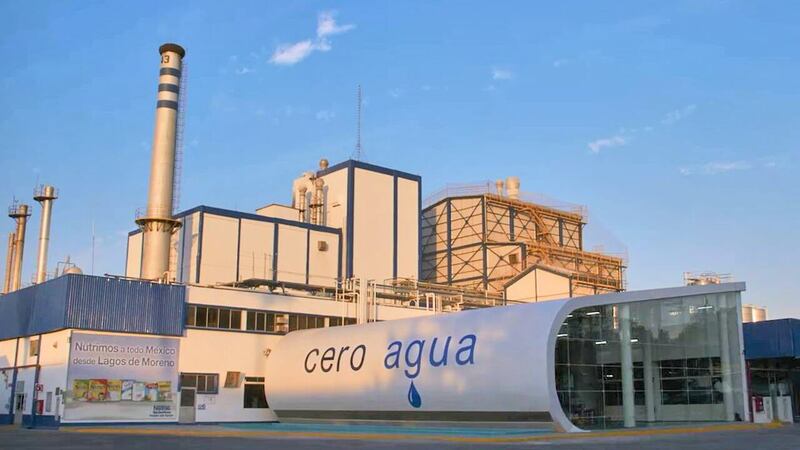 The company won the award, voted on by audience members at the Global Water Summit in Athens and online members of the 2030 Water Resources Group, for its ‘ZerEau’ water initiative, piloted at its ‘Cero Agua’ factory in Mexico’s water-scarce Jalisco state. “This prestigious award means a huge amount – it’s a vindication of five years hard work from our team on this project. This technology is unique within Nestlé, and it’s by no means an accepted industry direction,” said Jim Knill, Nestlé’s head of dairy operations. The site is the first to pilot use of Nestlé technology that allows the site to operate without using groundwater during normal operations. Water is extracted from cow’s milk and treated to allow for its use as process water. The resulting effluent water is treated again and used for cooling and cleaning. “Twelve years ago I was told that this couldn’t be done, due to cost implications, water quality issues, the technical complexity involved. But we’ve shown that the technology works – now we want to apply it elsewhere,” Knill said. Following the success of its pilot in Mexico, Nestlé plans to retrofit other dairy factories situated in water-stressed areas of South Africa, Pakistan, India and China with the technology. Such water-saving technologies form part of Nestlé’s work to achieve water efficiency and sustainability across its operations, by minimizing the impact of its operations on natural water resources. Come and meet the 2030 WRG team in Daegu, South Korea, by visiting our booth. Learn more about our multi-stakeholder initiatives in Mongolia, South Asia and the LAC region by joining our country sessions at the Swiss Pavilion. 2030 WRG takes part in (water related) events to contribute to raising awareness of the water resources challenges, sharing our experiences and lessons learned when connecting with our partners and forming new allies. This is important to us as we build lasting partnerships and networks for our future water security. 2030 WRG hosted a session on ‘Collective Action for Agri-Water Efficiency and Non-Point Source Pollution in the Ganga Basin – A Multi-stakeholder Approach’, and also supported a session hosted by the FICCI Water Mission on ‘Imperatives for Urban Waste Water PPPs: towards a viable business model for municipal sewage treatment’ during the India Water Week. 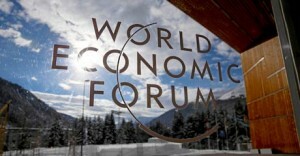 The annual 2030 WRG Governing Council meeting was held during the World Economic Forum Annual Meetings in Davos, Switzerland. Council members reviewed the achievements of 2030 WRG to date and discussed the outlook for the year ahead. Acting Chair, Indra Nooyi, PepsiCo CEO, led the discussions on the role that 2030 WRG should play in addressing the daunting water challenges ahead, taking into consideration the global water agenda and the Sustainable Development Goals. The event was followed by a session on the global water agenda where participants discussed the mobilization of the private sector to step up to support, partner and leverage new models of cooperation to implement the ambitious (water related) Sustainable Development Goals. 2030WRG was asked to participate in the WWC session on ‘Water Security: A Pathway to Sustainable Development’ as a panelist for the second panel on Mobilizing Action facilitated by Jerome Delli Priscoli, U.S. Army Corps of Engineers. Other panelists included John Tubbs, Director of Natural Water Resources of Montana; J. Carl Ganter, Director Circle of Blue; Zafar Adeel, Director, UNU-INWEH; and John Oldfield, CEO WASH Advocates. 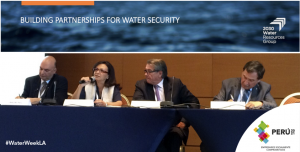 2030 WRG was well-represented at the Latin America Water Week that was held in Chile this year. The LAC team convened a session on ‘Promoting dynamic multi-stakeholder partnerships – public, private and civil society’. The seminar demonstrated how 2030 WRG provides key analytical work to help implement, fund and prioritize key water projects and explained how multi-stakeholder platforms are formed and finally elaborated on the future expansion of the program in Latin America and beyond. A 2030 WRG booth at the expo provided the opportunity for participants to connect with the LAC team and learn more about the work programs. 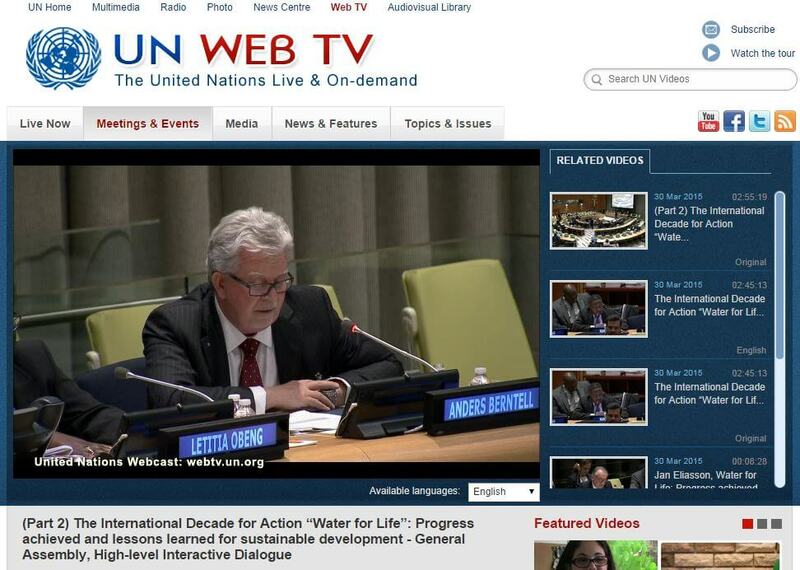 Anders Berntell, 2030 WRG Executive Director, speeches at the UN General Assembly in NYC. The 7th World Water Forum was held in Daegu, South Korea and provided 2030 WRG with the opportunity to take part in various sessions organized by partners including presentations held at the Swiss Water Partnership booth as well as a session with IUCN entitled ‘Does Paying the Environment for Water Services Really Work?’ and another session organized by OECD on Finance for Sustainable Water Management. Though the 2030 WRG representation at the Forum was light there was still ample opportunity to exchange country experiences between the Peru, Mongolia and India staff and consultants present in various bilateral exchanges as well as at the 2030 WRG booth. Anders Berntell traveled to Greece to engage in various bilateral discussions with selected private sector partners to discuss fundraising potential and also gave a speech at this year’s Global Water Awards ceremony. This was to award the first Corporate Water Stewardship Award with Nestlé as the first-time winner for piloting technology that allows a Mexican dairy factory to operate without using any local groundwater. The prize honors the company which best reflects the objectives of the 2030 Water Resources Group in achieving creative solutions for improving water security. At the Global Green Growth Forum’s Regional Conference in Nairobi, Kenya, 2030 WRG and 3GF jointly launched the case study ‘Perspectives on Green Growth Partnerships – Strategic Water Partners Network’ that was developed by 3GF. 2030WRG participated in a private water session at the WEF Africa event on 3 June on “Accelerating Water Enabled Growth in G77 Countries”. The impact of water crises around the world has been recently recognized as a top risk by the World Economic Forum with business leaders reporting concerns over looming water crises. This highlights the importance of innovative and novel solutions to help manage and mitigate the risk of water crises affecting society, industry and the environment. The 2030 Water Resources Group is taking a leading role in identifying and publishing examples of initiatives that have been implemented to manage water scarcity. In 2013, on behalf of the 2030 Water Resources Group, Arup identified 39 case studies from around the world that showcased such innovative solutions in ‘Managing Water Use in Scarce Environments: A Catalogue of Case Studies’. The publication inspires action and is utilized throughout the world by leading industry, policy makers and the 2030 WRG country programmes. 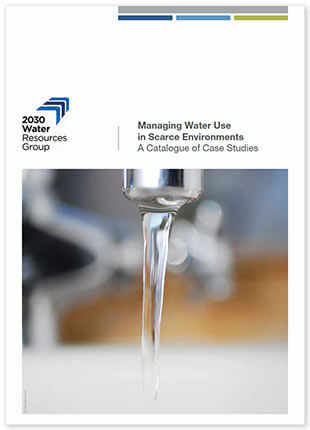 Following the 2013 publication, the 2030 WRG is launching a revised and updated catalogue of initiatives that have been undertaken to reduce water use or manage water risk. This will be launched at Stockholm World Water Week 2015 and disseminated widely across leading corporates and national policy makers. 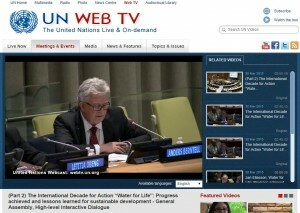 The 2030 Water Resources Group is a unique public-private-civil society collaboration. We facilitate open, trust-based dialogue processes to drive action on water resources reform in water stressed countries in developing economies. The ultimate aim of such reforms and actions is to close the gap between water demand and supply by the year 2030. The 2030 WRG emerged in 2009 through an informal collaboration between the International Finance Corporation (IFC), the World Economic Forum (WEF), multilateral and bilateral agencies (Swiss Development Corporation), private sector companies (Nestlé, PepsiCo, The Coca-Cola Company), and other organizations such as the World Wildlife Fund (WWF). The World Economic Forum in their annual Global Risk Report, building on the expert opinion of some 1000 international experts, leaders of companies and international organizations, has for five years ranked water among the top five Global Risks. This year it is ranked as number 1. Similarly the CDP Water Disclosure Report has over the last years reported on an increasing number of companies that share this belief. In the 2014 report 68% of the companies (all of them are amongst the Global 500 companies) reported that water poses a substantive risk to their business, and 22% reported that issues around water could limit the growth of their business. It is clear that water availability and/or water quality poses a real risk not only to people and ecosystems, but also to countries and their economies. Growth is thirsty, and all production has a water footprint, 130 liters of water was required to grow the beans that produce one cup of coffee. My total water footprint for food only, as an average US/European citizen, is probably above 4000 liter per day, because of all the meat and dairy products I use. A vegetarian Indian or a Chinese with less meat in the diet has a footprint of about 2 000 liter. But not only food has a water footprint, any production of any goods requires water. The growing number of people in the world increases demand for food, commercial goods, energy and water. Changing patterns of consumption – not just the growing head count – creates demand for more water. To provide the energy and quality of food that people need and want to make a better life, particularly in developing countries, there are shifts to more water-intensive production methods; grain-fed meat, for example, is now part of the food chain in developing countries as well as developed markets. Global water requirements are projected to be pushed beyond sustainable water supplies by 40 percent by 2030 in a business as usual scenario. A big component of this is increased agricultural water needs. 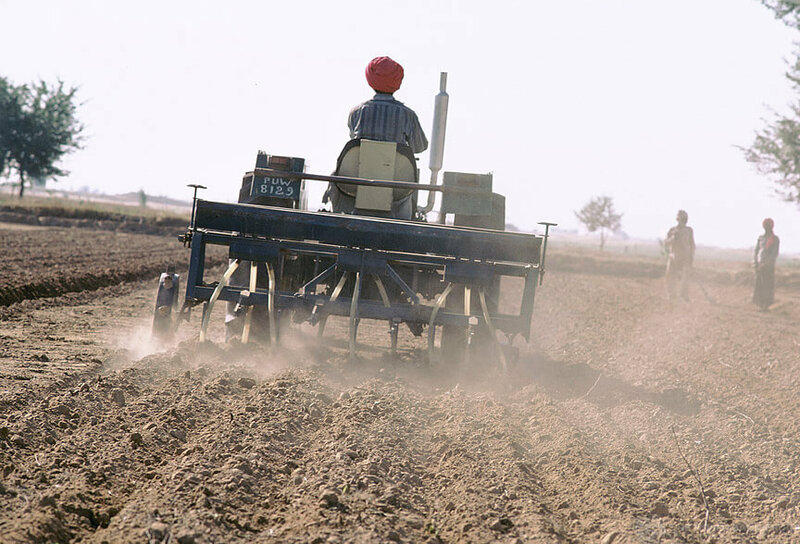 Agriculture already accounts for 70 percent of total average water consumption worldwide. By 2030, food production will have to increase by 50 percent to meet needs of a growing population and dietary changes, with a potential increase of water demand of the same size, unless we produce that food more water efficient. The International Energy Agency further projects water consumption to meet the needs of energy generation and production to increase by 85 percent by 2035. Today, many regions of the world are already water stressed due to population and economic growth. 2.5 billion people (36% of the world population) live in these water stressed regions and more than 20% of the global GDP is already produced in risky, water-scarce areas. A recent report by IFPRI (International Food Policy Research Institute), found that 4.8 billion people – more than half the world’s population – and approximately half of global grain production will be at risk due to water stress by 2050 if status quo/business-as-usual behavior is followed. The IFPRI study also found that 45% of total GDP ($63 trillion) will be at risk due to water stress by 2050. That’s 1.5 times the size of today’s entire global economy. The nexus of food, water, energy and climate change is “one of four overarching mega trends that will shape the world in 2030,” and these risks are further related to other risks like large-scale involuntary migration, according to the Global Risk Report. And we know that water scarcity and water pollution is already today affecting economies in many countries. We see investments being stopped because the investors are not sure that the water that is needed for the operation of the production is guaranteed. Examples are found in agriculture and hydropower in Africa, mining in Peru and coal power plants in China, amongst others. Other examples are found where water quality becomes an issue not only for people and ecosystems, but for the requirements of industry itself such as the textile industry in Bangladesh, and other industries in China and India. And we also know the effects of lack unsafe drinking water and inappropriate sanitation has on people’s health, and thereby also on the economic development of countries. The 2030WRG is a Public-Private-Civil Society initiative. We were founded on the understanding that the challenges ahead of us are too big, and too complex, for anyone to resolve if working on their own. We need to join hands and work together across sectors (agriculture, energy, water, industry, financing etc) and also across the divide between public, private and civil society actors. We were established, couple of years ago, by a few global companies, food and beverage, (Nestle, PepsiCo, and the Coca Cola Company) but many more companies have joined our work in the countries where we operate. Bilateral donors such as Sweden and Switzerland and IFC (World Bank Group) were also among the founding partners, but also others are supporting our work in different countries such as Germany, USA, AfDB and IDB. Many other organizations are working closely with and supporting us such as UNDP, GWP, WWF GGGI and others. The reason why we were established is beyond the direct self-interest of the companies involved, and the concern for their own production/manufacturing of products. We were established because these companies were concerned about what water scarcity, and other challenges such as water quality, will do to the development and the economy of countries where they operate. One can describe it as a long term, enlightened, self-interest of the companies. They depend on countries where the economy is growing, where development is not jeopardized because of lack of water and where people’s livelihoods is improving. In the countries where we work, we create a platform where the government in that country can sit down with the water using private sector from that country and the civil society, and discuss together what needs to be done to address the water challenges they are facing, and how they can do that by working together. We call these platforms “Multistakeholder platforms”, and the objective is to facilitate and stimulate collective action for improved management of the water resources and reduced demand by using the water more efficiently. In the countries we have worked, we have been able to show how effective and powerful this approach can be, such as in Mexico and Peru, South Africa, Kenya and Tanzania, India (including in the states of Maharashtra and Karnataka) Bangladesh and Mongolia. We are convinced that this approach, by making the various stakeholders work together to develop concrete solutions to the challenges they are facing, is a very effective way to reduce the risk of water scarcity in their country. A Mongolian Water Scientsts Forum was organized on 19 March on the occasion of World Water Day. The Forum was sponsored by the Global Water Partnership and 2030 WRG and sought to prioritize and analyze water issues in the sector and make recommendations and provide proposals for an appropriate solution and approach to implementation. Approximately 150 participants attended, including government officials and representatives of private sector, NGOs, research institutions, and universities. The Mongolian Country Representative, Dorjsuren Dechinlkhundev gave a presentation on “water resources and trends of water demand increase in the Mongolian context”.